The popular Amazon store is now official in Saudi Arabia. Get affordable, and fast shipping, cash on delivery, online shopping in Riyadh, and a whole lot more..! 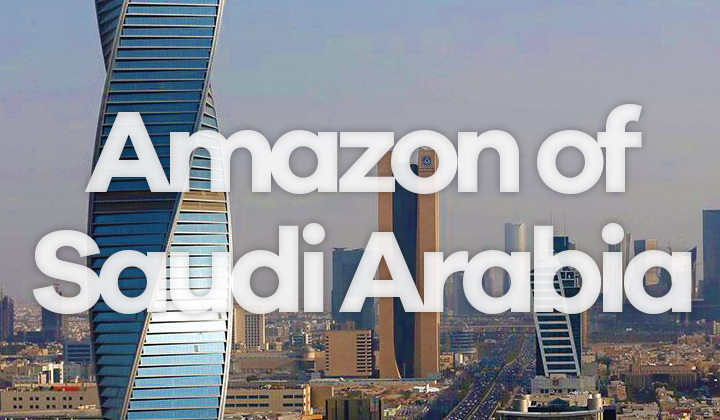 Also, the Saudi version of Amazon is both in Arabic and English. In 2019, the e-commerce scene in Saudi Arabia and the rest of the Arabic world has been dominated by Amazon, the most competitive online store brand. Weather you are in Riyadh, Jeddah, Mecca, Medina or pretty much anywhere else in the country, you’ll likely find the most reliable, equivalent service there. The official Amazon website, goes with the name Souq in Saudi Arabia. So there’s no need to pay for expensive global shipping with Amazon.com, or even worse, use package forwarding services that cost a ton. Here’s a guide on how to really buy from Amazon in Saudi Arabia. The Dubai headquartered Souq is now officially the largest and most popular website for e-commerce in the Arabic countries. The company was founded by Ronaldo Mechor, a Syrian businessman in 2005. But since 2017 the company was acquired by Amazon and has become one of their strongest online shopping brands since. The site interface is very much similar to Amazon, and one of it’s attractive features is the seller portal which further expands it’s inventory to serve the increasing online shopper population which has become accustomed to world class service. Useful tip! The Saudi Arabian Souq has a “deals of the day” page, where you can find the hottest deals, every day of the week. Some with free shipping included. The Souq marketplace mainly uses courier services to delivery to your door, and they also support cash on delivery payments with Riyadh, for an extra charge. Just like when shopping on the US based Amazon, you need to add items to the shopping cart first, and then proceed to checkout which will display the final cost of shipping. Delivery is Saturday to Thursday from 9:00 to 18:00. Shipping is readily available to cities such as Dammam, Ta’if, Al Kharj, Medina, Sulţānah, Tabuk, Buraidah, Riyadh, Jeddah and Mecca. Also all of the Saudi Arabian regions can be delivered to (door-to-door); Bahah, Ha’il, Saudi Arabia, Najran, Asir, Northern Borders, Jizan, Tabuk, Eastern Province, Makkah, Jawf, Riyadh, Qassim as well as Madinah. On the US based Amazon, you only have support for English. On Souq however, Amazon has included support for both Arabic & English languages. See the flag of Saudi Arabia at the top, clicking on it will open up a menu where you can change language and country location settings. The website is mostly bilingual, meaning that product descriptions, shopping guides and the whole interface language can be changed. Beauty, Fragrances & Perfumes, Supplies & Pet Food, Eyewear, Movies & Music, Bath & Bed, Home Improvement & Tools, Office Products, Networking & Computers, Paper money & Stamps, Home Appliances, Home Supplies & Kitchen, Furniture & Home Decor, Personal Care, Toys, Books, Cameras, Kitchen Appliances, Babies, Wearable, Gaming, Outdoor & Garden, Apparel & Accessories, Vehicle Parts & Accessories, Collectables & Art, Fitness & Sports, Electronics, Tablets & Mobile Phones, Jewelry & Accessories and Beverages as well as Grocery. To battle counterfeit or poor quality items, you can return purchased goods within a 15 day time frame if the items are not as described on the website. This also includes the cost of sending them back to Souq for evaluation. In other cases, if you simply wish to return your purchase, you can use the same 15-day guarantee to get your money back if the package is left unopened. Please be aware, that some items have a “non-returnable” tag. And also some categories such as Lingerie, Earrings, Underwear, Swimwear ,etc. is excluded. And that concludes my Saudi Arabia guide for the official Amazon marketplace. There are alternatives to Souq in the country, however they are the only real equivalent and similar service. And likely availability & pricing is competitive there. Have your say in the comments below, or ask questions..! I’m happy to discuss about Amazon & e-commerce in Saudi Arabia. Thanks for your kind visit. Sincerely, David. Nothing to worry about, but you might be interested in knowing that some of the posts, guides, etc. contain affiliate links to support the site. This won’t affect pricing on the other end and helps me out tremendously. Thank you so much.